Black Wednesday refers to the date 16 September 1992, when the UK was forced out of the ERM. Market speculators such as George Soros, felt the government’s position was untenable and at some time they would have to devalue. Therefore, the speculators kept selling pounds, forcing the treasury to keep buying them and the government had to keep raising interest rates. It was estimated the cost of the government’s intervention was £3.4bn. At the time the treasury spent £27bn in buying sterling on the foreign exchange markets. However, whatever the government did, the markets felt the government couldn’t maintain it in the long term. Eventually on 16th September the government admitted defeat. It left the ERM and allowed the pound to depreciate on the foreign exchange markets. 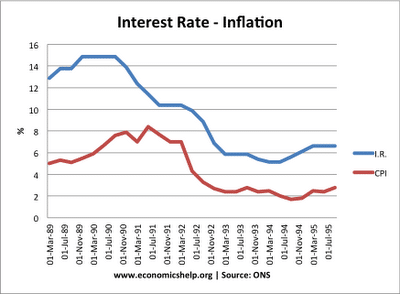 It meant the government could cut interest rates and this allowed the UK economy to recover from recession.